Meteor House » You can be a character in the new Stringent Strange novelette! You can be a character in the new Stringent Strange novelette! The Abnormalities of Stringent Strange by Rhys Hughes may turn out to be the most inclusive, and fun for the reader, project in the history of small press publishing. To begin with the novel is a pulpish comedy science fiction/surrealist metafictional romp that is, for some reason, rather hard to describe other than to say it is unlike any book you have ever read. That is a promise. So, first we held a charity auction where readers could bid to be a character in the novel. Part of the proceeds from this auction went to charity. Next we allowed readers to purchase a unique “deleted scene,” which depicts themselves as a character in the story but will not appear in the printed novel. Part of the proceeds from this go to charity as well. Then yesterday Rhys Hughes announced he is writing a brand new novelette featuring Stringent Strange, “The Further Fangs of Suet Pudding,” and that an ebook of this story will be sent for FREE to everyone who pre-orders a copy of The Abnormalities of Stringent Strange. Now here is the next step in the evolution of this metafictional event. If you preorder a copy of The Abnormalities of Stringent Strange with a deleted scene no later than November 30th, 2012, you will appear in “The Further Fangs of Suet Pudding” as a character! 1. Preorder a copy of The Abnormalities of Stringent Strange and you will automatically be sent a free ebook copy of “The Further Fangs of Suet Pudding” as soon as it is finished (most likely early December). 2. If you also purchase a deleted scene from the novel by November 30th, you will appear in the novelette as a character! 3. If you already preordered the novel, but not a deleted scene, you can still order one and get in the novelette. Don’t miss out on a unique event in publishing and an absolutely terrific novel to boot. Keep watching this website for further news and excerpts from the novel which will be posted online. 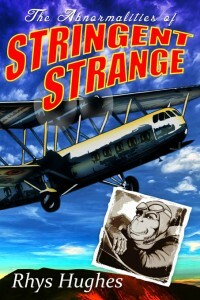 Comments Off on You can be a character in the new Stringent Strange novelette!